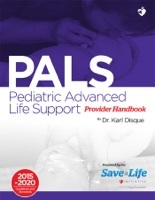 The Save a Life Initiative has just released its newest course: Pediatric Advanced Life Support (PALS). This manual is based on the 2015-2020 Pediatric Advanced Life Support guidelines published by the American Heart Association. The Pediatric Advanced Life Support (PALS) Provider Handbook is a comprehensive resource intended for health care professionals currently enrolled in a Pediatric Advanced Life Support Certification or Recertification Course. It serves as the primary training material for PALS Certification and Recertification courses. Although it is primarily intended for use during certification courses, the handbook was also created to serve as daily reference material for health care professionals. Information covered in the handbook includes EKG and electrical therapy review, pediatric respiratory failure and more. Specific PALS Algorithms and more are also included within the handbook. All material included in this handbook is delivered in a manner meant to enhance learning in the most comprehensive and convenient way possible.